Chloe’s old room is quickly turning into a guest room/office for the moment. 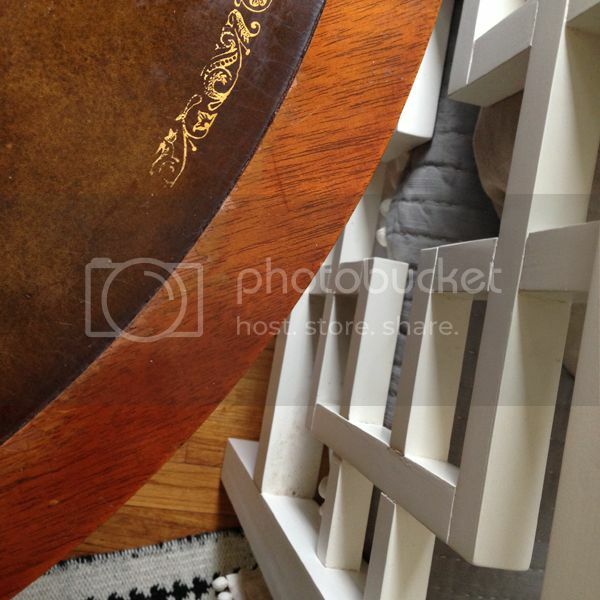 Again, we are working with what we have, hunting the house & revamping items to give them a new life. I was thrilled to be able to bring this wood pedestal table back into the house & out of storage, as I am craving natural wood finishes this year. I love a painted look, but when a room is filled with only painted items it is really nice to include a visual break with some natural beauty. But the old leather top needed a little TLC. This was one of those many tables out there that had this sweet little scrolling floral gold motif on it’s perimeter. While it was fine where it was, though worn in places, it did not fit with my intended plan. I shared on Instagram that nail polish remover & a quick hand removes the motif. It made the leather a little cloudy, but once it was completed I washed the entire surface with some mild soap & warm water & it disappeared. 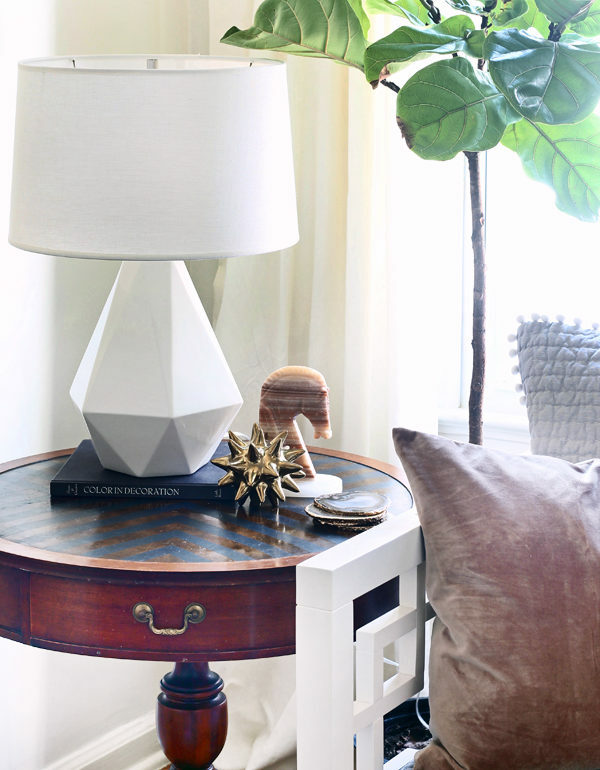 I then set out to create a similar look to this DwellStudio table. Obviously these are completely different table styles, but I really liked the idea of using the pattern on the leather top. This was a brain warp… I’m not going to lie. I tried to be smart & use my Silhouette machine to make a stencil using the vinyl… hence the pink. But as it only prints in 12″ widths, I had a hard time piecing the next ones together. So I ended up using Scotch Blue tape in 1″ widths to continue the pattern. I eyeballed this! So I recommend actually using a ruler. One of those do as I say, not as I do moments… To get the crisp corners with the blue tape I used an exacto knife & just a little pressure to cut thru the tape only & not the table. I used my Velvet Finishes paint I shared last week to fill in the open spaces. I brushed on two thin layers & really liked that you could still slightly see the leather coming thru. I wanted the table to feel as is, not “painted”. Even though you don’t need to seal this paint, I wanted to seal the entire surface & bring a luster back to the original top. So I added three layers of Annie Sloan Soft Furniture Wax. I love how it added a subtle luster to the top helping it tie in to the existing piece. I am thrilled with the subtlety this project ended up having. Again, not looking for a “Hey I’ve been painted!” look. I have topped it with my new favorite lamp, the Delta Lamp in Lily by Robert Abbey. LampsPlus was kind enough to send me this lamp to review & having had a longstanding crush on this piece, I can say that it surpasses all of my expectations. Plus, this baby comes in almost every color. Including a few limited edition two tone versions. I’ll be sharing much more about this quick room makeover from playful big girl room to sophisticated guestroom/office over the next few weeks. You are not going to believe how the same room transforms so easily by adding a few new elements, and some rearranging. I thought I loved the room before… I am adoring it now! Btw… I am participating in Project Sofa today over at Style Me Pretty Living (starting at 9am EST) thanks to the uber talented Roxy from Society Social. There are 10 Designers who have each selected their favorite Society Social Sofa & styled it with a range of pillows. Head on over to see the designs & features all day & vote on your favorite look. 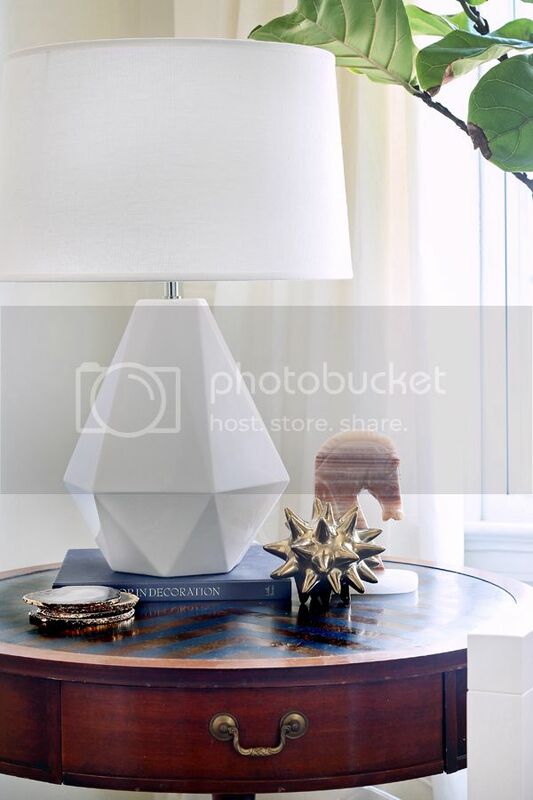 **LampsPlus did provide me with this lamp to review, but the review & images are completely those of the Hunted Interior. gorgeous! 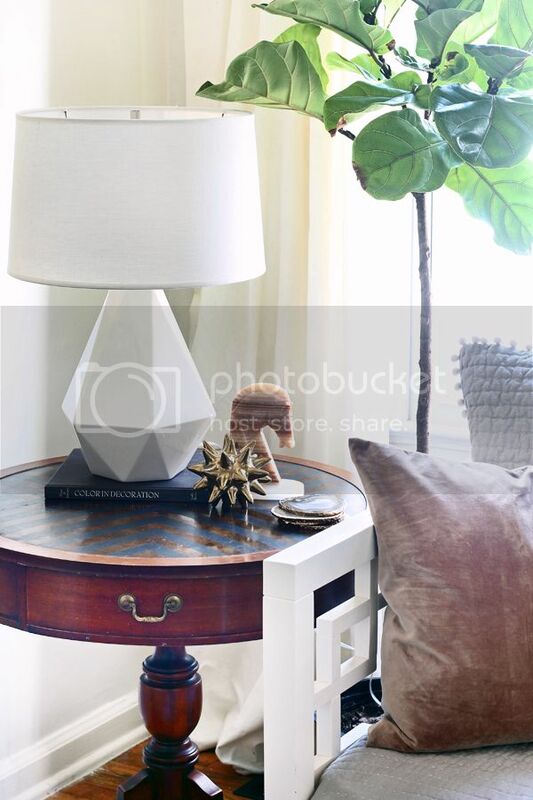 love the way the angled lines on the table work with the angled lines of the lamp. Beautiful! I love the painted leather. 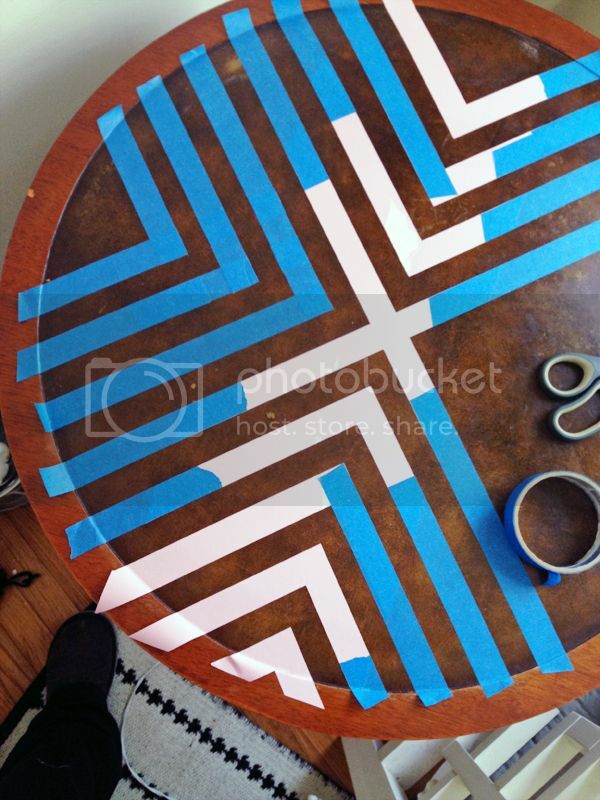 I painted our coffee table with the same pattern: http://ourhumbleabodeblog.com/2013/10/23/v-stripes/ Measuring to tape off is a huge pain. But the results are worth it. This makes me even more excited to see the whole room. Gorgeous! Love that subtle chevron print! I totally agree that it's important to have some wood pieces in a room of mostly painted furniture! Love everything you do! 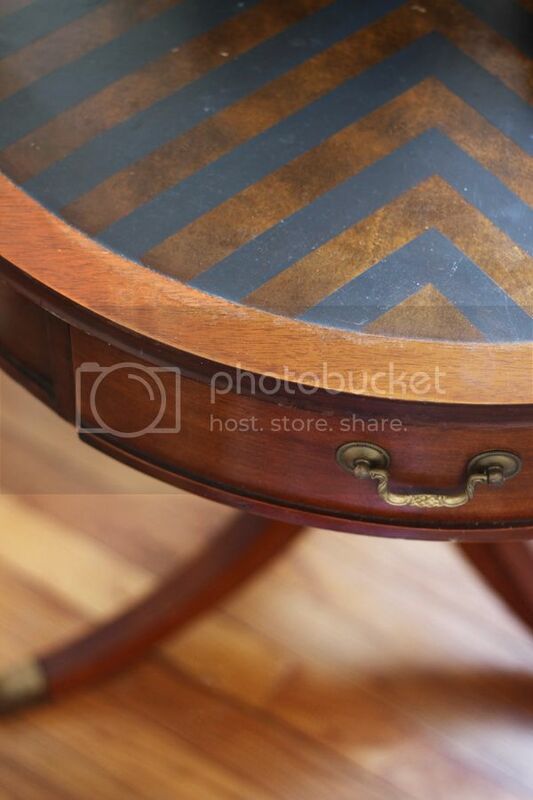 I really like how subtle the pattern is and how the color really melds well with the rest of the table. Can't wait to see more. Love how this turned out! Looks great! Love the color you used! It turned out great! Wow – that looks amazing and love the lamp!! It looks beautiful! You definitely achieved a "not painted look." I have to try out that new paint you are raving about! I love that the wax is already included! beautiful! I love how it turned out! Super Cute! I love the update to this table, and that lamp is amazing btw. Great idea….always a little wood for warmth! Gorgeous my friend – you did not disappoint!